As travel restrictions to Cuba change, new adventures beckon from the Caribbean island previously closed off to American tourism. Now is your chance to be part of a new era of adventure travel to Cuba–a country rich in culture and enchanting natural landscapes. 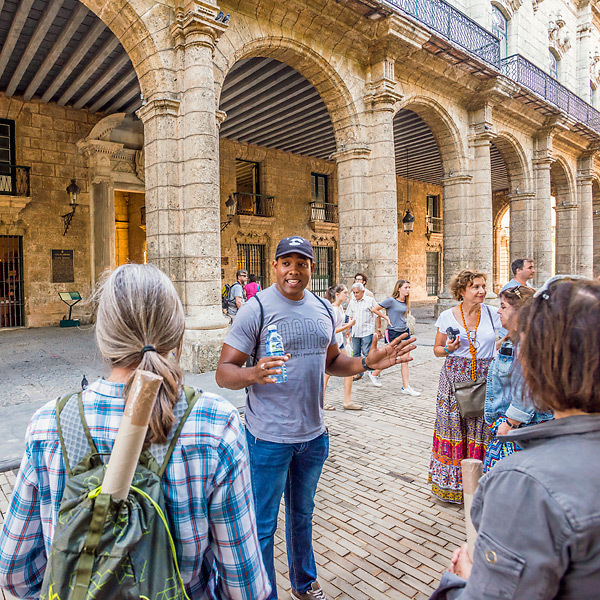 Traveling through Cuba’s cities, coastlines, and mountains, this itinerary, developed by our longtime friend and former OARS guide Joslin Fritz, offers a chance to experience the diversity of the country while encouraging and facilitating cultural connections. 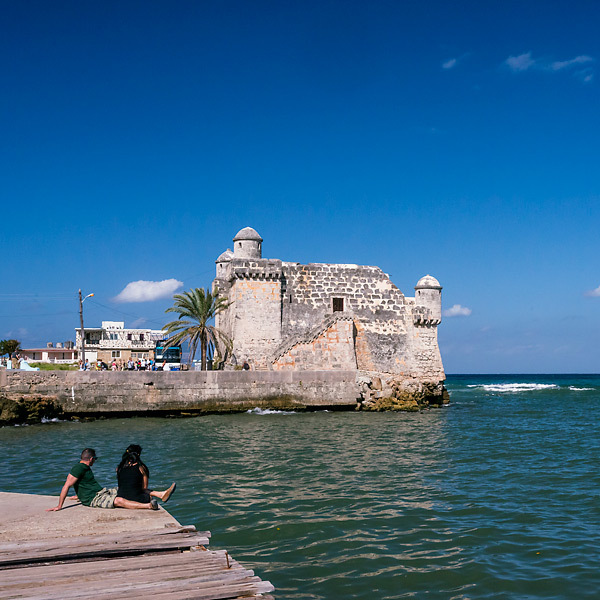 Since 1963, American tourism to Cuba has been prohibited and the tumultuous relationship between the two countries spanned decades. As regulations have changed and people-to-people travel has been approved, now is the time to meet and learn from the locals, walk through the colonial plazas, travel in 50s era Chevy’s, and glide along the aquamarine coastlines without the crowds. Join us for our new Cuba program for an adventure that’s sure to both inspire and educate, mystify and delight. The draw of Havana is hard to pin down. Is it the colorfully beautiful but dilapidated baroque and neo-classical architecture that’s so interesting in its contradictions? The guitars, voices and high energy of the Mambo that permeates the streets with excitement? 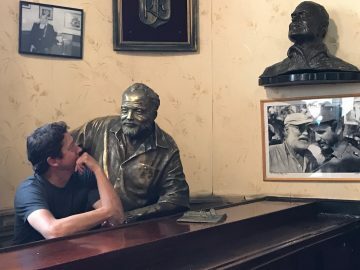 The Hemingway and Guevara legacies that inspire, entertain and enchant? 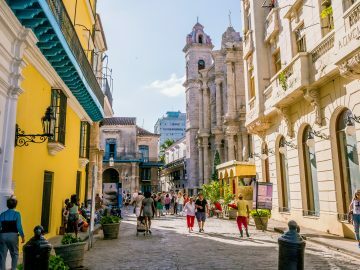 Havana has it all for a curious explorer, and we will kick off our itinerary roaming its streets alongside classic cars, sampling it’s cuisine in unmarked local haunts, and resting soundly in its historic center. 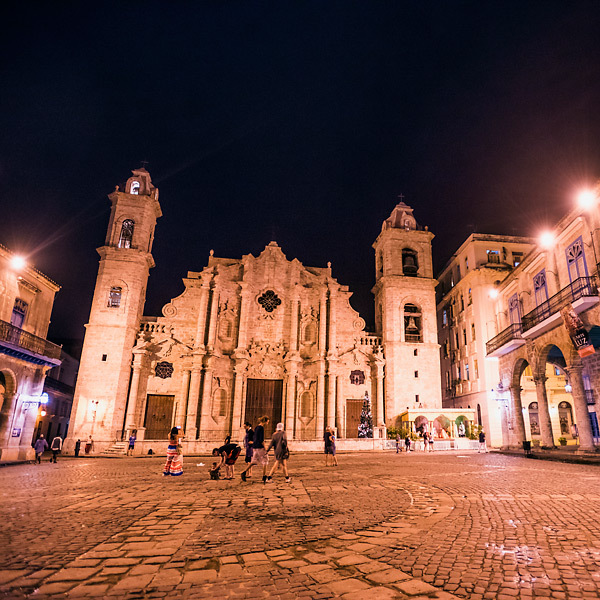 One of our highlights in Havana will be the time spent in Havana Vieja, the old city, which is a designated UNESCO World Heritage Site. This incredibly resilient city has seen pirates and fires, guerrillas and revolutions, and has endured to offer a glimpse into a complicated but beautiful country. Our journey begins and ends in this incredible city, allowing our guests time to soak in its fascinating history. Legal travel to Cuba falls under 12 categories, one of which is people-to-people travel. 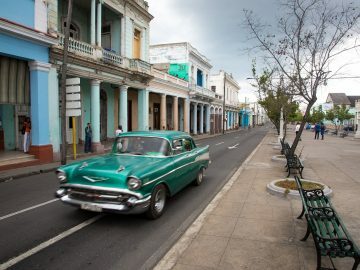 As defined by the US Treasury Department, people-to-people travel is “intended to enhance contact with the Cuban people, support civil society in Cuba, or promote the Cuban people’s independence from Cuban authorities, and that will result in meaningful interaction between the traveler and individuals in Cuba.” As travelers under the people-to-people stipulations, we look forward to connecting our guests to the joys of Cuban culture. The people-to-people cultural exchanges our itinerary offers are sure to be some of the most memorable experiences on your trip to Cuba. On our very first day we’ll visit Jose Fuster’s house in the Jaimanitas neighborhood and learn about his artwork and vision for his community. After spending time in Havana mingling with the locals, we’ll head to the Viñales Valley where we’ll meet local farmers and learn about tobacco cultivation and organic farming in Cuba. Later, we may have the opportunity to watch a musical or dance performance and be able to interact with the performers. The next people-to-people encounter brings us to the Jardin Botánico Cienfuegos, a botanical paradise where over 2,000 plant species are grown. We will explore the gardens and listen to the staff as they share their wisdom and insight into this diverse and beautiful place. And finally, we’ll meet up with a local expert guide for a waterfall hike in Topes de Collantes National Park, where we’ll learn more about Cuba’s unspoiled natural environment. While the incredibly pristine coastlines in Cuba are widely attributed to Castro’s commitment to conservation, the struggling economy and lack of tourism to Cuba has also worked to preserve Cuba’s place as the most biodiverse in the Caribbean. More than 20 percent of Cuba’s land is under federal protection and we will have the opportunity to explore some of its most pristine places. Leaving Havana, we will explore the island’s stunning southern coast, including overnight stays in Playa Larga and later, Trinidad. Playa Larga, a landing site during the historic Bay of Pigs revolution, is now known worldwide as a diving mecca, famous for its coral reefs, flooded caves, and colorful marine life. This protected and pristine bay beckons travelers to snorkel and paddleboard its turquoise waters. In Trinidad, which offers us a well-preserved glimpse at Cuba’s colonial past, we’ll be well-positioned to hike in nearby Topes de Collantes National Park, a nature reserve that’s rich with trails and wildlife in the Escambray Mountains of Cuba. WHY CHOOSE OARS FOR A CUBAN VACATION? OARS has been in business for over 45 years and that is no accident. We thrive on creating adventures that take you off the beaten path and away from the crowds to magical landscapes, rivers and coastlines. 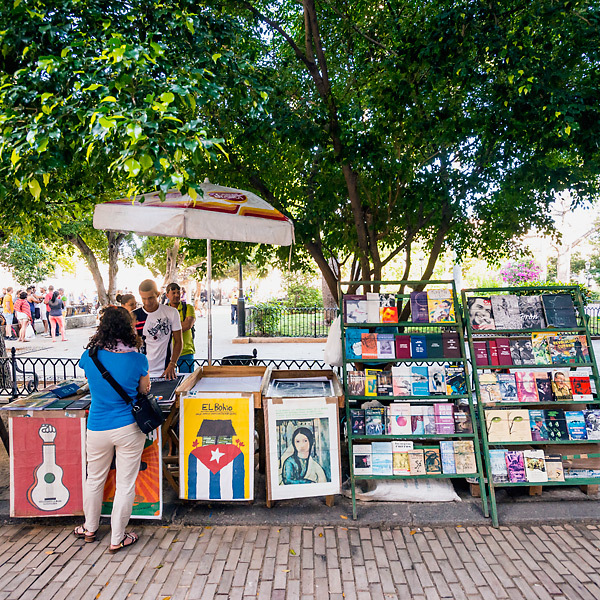 National Geographic, Outside, Men’s Journal and Sunset magazines along with NBC, CNBC, Forbes Traveler and SmarterTravel.com have all recognized OARS for serving up some of the “Best Trips on the Planet.” Our Cuban adventure is no exception. With more than 150 years of combined experience in the adventure travel industry, our staff of knowledgeable adventurers has put together an intimate trip exploring its historic cities and pristine Caribbean Coast, and learning from its tumultuous past and culturally diverse people. We believe it is a fundamental part of adventure-tourism to work with local guides while at the same time bringing our wealth of experience to the table. In addition to our tour leader, we provide highly-skilled local guides for various activities. 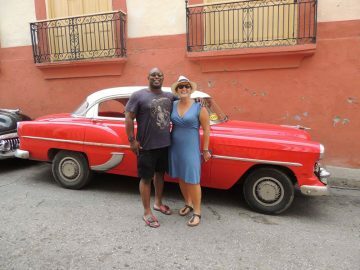 These local tour guides share their personal experiences with guests as well as general information about the region and culture of Cuba. Our like-minded partners realize they are accountable to OARS high standards, so you can rest assured you will be in be in good hands. OARS has taken out the guesswork and added our guarantee. We hope you have an opportunity to join us for this once in a lifetime Cuban adventure.